Basic color is dark brown or black. Dorsal fin has rows and stripes of white on black. Large males have iridescent blue and ebony markings and a fatty hump in front of the dorsal fin. Females may have indistinct vertical barings. The topmost ray of the caudal fin is much elongated in adults and may be tri-lobed. A sharp spine is located near the posterior margin of gill cover. 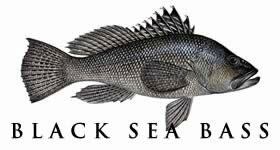 Black sea bass are structure-loving fish and are associated with reefs and rubble found offshroe. Smaller specimens are often found inshore in finger channels. These fish spawn January through March and are protogynous hermaphrodites, meaning older females becoming breeding males. Black sea bass are omnivorous bottom feeders, and their diet includes small fish, crustaceans, and shellfish.